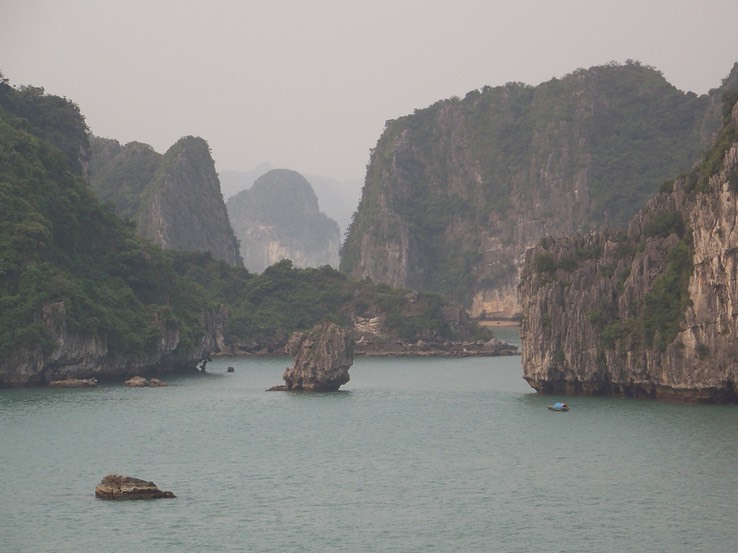 Ha Long Bay, in the northern part of Vietnam, has one of the most unique landscapes on earth, and in order to preserve it, Ha Long Bay has been designated a UNESCO World Heritage site. Because of stormy seas, our ship was not able to make it to the port according to plan so we were up in time to see the sail in to this amazingly beautiful port. All these islands, along with some similar-looking mountains near the coast, are formed from limestone. At least one of the islands has a large cave that we saw on our last visit here. The distant photo here gives you an idea of the size of the islands compared to a fishing boat. Since we had done the boat tour last time, we decided to try the new tour offering which took us to the Red River Delta. 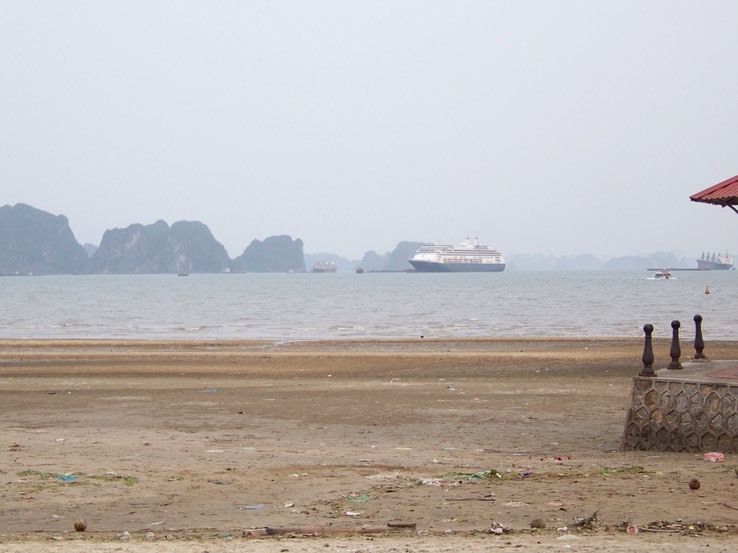 This is a port where we have to anchor, and we apparently had mixed up communication with the Vietnamese immigration officials. We were sent down to board the tender, and then had to wait for quite some time for the ship to be cleared, and for the officials to get set up for stamping our shore passes. We pitied the people who were waiting for all this time in the tender (some had been allowed to board the tender before the mis-communication was discovered). Eventually all was straightened out and we headed for shore. Our first stop was for the “happy house”, the Vietnamese term for the WC, potty, etc. From there we proceeded to a traditional village where the main way of earning a livelihood is betel nut farming. Although the climate is significantly milder than in the south, the climate is still good for growing palm trees (betel nuts are the fruit of Areca palms) as well as some of the tropical fruits. One can buy Jackfruit, Durian, Rambutan, Lychee, Pineapple, Noni, and other tropical fruits at the local markets. This village is one that was just recently discovered by the tour company that provided our guide. We were mobbed by children while visiting a traditional home in the village and while walking back to the bus. We were greeted cordially by the man who owns the house, and the family provided us with a nice snack and tea. Several of the children asked us to write our names in their notebooks, and several requested that we take a photo of them. It was wonderful to have them so excited by our visit. As you can see from the photo, they are beautiful and happy children. We next drove to the city of Hai Phong, where we had a nice buffet lunch at a hotel. After lunch we took a walk through a traditional market, where they had some very interesting things for sale. In addition to the usual vegetables and fruits, they had big fat frogs, beautifully bound up crabs, ducks in a bag with holes cut for their heads to stick out, eels, fish, dried noodles, large squid. There were also vendors with the traditional baskets on a pole, or on their bicycles. We also went to the flower market, which is bright with colorful flower arrangements. Hai Phong is the third-largest city in Vietnam, and the largest port in the north. It is a thriving, busy city. Most of the people ride bicycles, motor bikes, or motor scooters. The motor bikes from China are popular because they cost only about $300 US, whereas a Honda bike will cost $1000 US. During our bus rides our excellent guide, Tho (pronounced Taw), taught us many things about Vietnam. One very interesting fact is that a long time ago Ho Chi Minh decided that politics and religion should be separated; this is how the Vietnamese have ended up having a communist country and yet still being a very religious people. least in the north, the back sides of buildings are not decorated in any way, including painting. The back sides of buildings are always the color of concrete. This is because the back of a building is not a public entrance. We learned about the water buffalo (unfortunately there are no clear photos), and what makes a good choice of animal. Tho said that an animal whose horns point forward will be less docile, so one should choose an animal with horns pointed up. The water buffalo is a much better animal for plowing than a cow, for the simple reason that it is more docile. Cows are apparently temperamental creatures, and water buffalo meat is tough, so the Vietnamese use water buffalo for farm work and raise cattle for eating. We also had a good lesson in Southeast Asian languages. Most of them are tonal languages. The Chinese language has four tones, Thai & Cambodian have five tones, while Vietnamese has six tones. He then proceeded to show us how one word could have six totally different meanings depending on the inflection used. And we think English is complicated! Our guide also told us about the Vietnamese burial customs. They bury their dead in a temporary location near water, so the flesh will decay faster, because after three years, they dig up and clean the bones and place them in a much smaller, brightly decorated coffin just large enough to hold the bones, that will be placed in the permanent burial location. Sometimes it takes five years for the bones to be in the right condition for final burial. It is an honor to have the job of cleaning the bones of the deceased. In the north of Vietnam they still use many of the old ways of doing things, so it is possible to see people following their traditional way of life. That life is not easy, but it is unspoiled by modern conveniences, and it is a pleasure to be able to see a culture that is unspoiled by western influence. If anything, this visit to Vietnam was more interesting than our prior one. This is a country that is intriguing with its combination of ancient and modern into a culture that is succeeding very well in today’s world. There are a few additional scenic photos in the album.